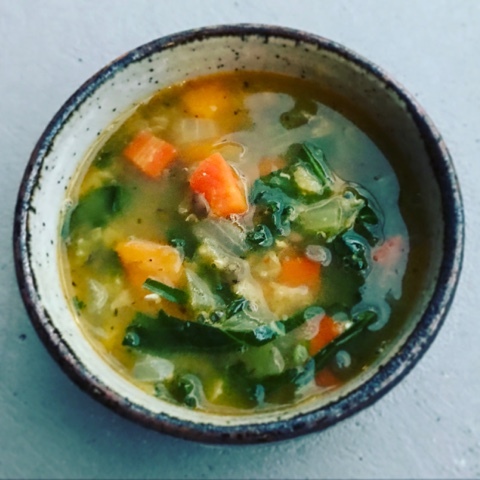 This soup is sort of like half vegetable soup (carrots, sweet potatoes, and kale), and half lentil soup (with both red lentils and brown or green lentils). The brown lentils keep their shape better when cooked, while the red lentils almost dissolve in the soup and give it a creamier texture. Overall, the soup is warm and comforting - perfect for a chilly evening. I used a really tasty spice blend from Penzey's that has both lemon and orange peel, and smells amazing. But, you can use any favorite spice/herb blend -- I think curry would be pretty fantastic too. The original recipe calls for pureeing part of the soup for a creamier texture -- I skipped this, and still thought the soup was excellent, but you can add this step if you prefer a smoother soup. Definitely don't skip the lemon juice at the end -- it brightens things up and really brings the flavors together. 1. Heat the oil in a large Dutch oven over medium heat. Add the onion, carrots, sweet potato, celery, and garlic, and stir to combine. Cook for 6-8 minutes, until softened. Add the spice mix, Aleppo pepper, and salt, and stir to combine. 2. Stir in the chicken broth and lentils. Bring to a boil, and then reduce to a simmer. Simmer for about half an hour, or until everything is tender. Turn off the heat, and stir in the kale and lemon juice. Taste and adjust seasoning. 3. Serve topped with grated cheese and crusty bread.